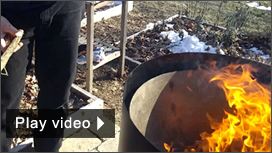 Below is a step-by-step instruction guide on how to make charcoal in the CharCone using smaller yard brush or other wood waste products. There are companion videos for each step where indicated. Please contact us if you have any questions or comments on these procedures. Note: Before you can make the charcoal, you have to locate and prepare the stuff you are going to burn. This “stuff” is commonly referred to as feedstock. This is a very important part of the process and requires some study, practice and the right tools to make sure your burn won’t be interrupted or compromised. We have a detailed guide on preparing and managing feedstock here. Feedstock – You will need 8-12 cubic feet of prepared feedstock to do a complete burn (ending up with a cone almost filled with charcoal). Do not underestimate this part of the process – this is quite a lot of stuff and takes a good deal of time to prepare properly. Make sure you have enough feedstock at hand and ready to go or you could find yourself running about late in the burn, looking for more (this seems to happen quite a lot). Either that or you will just have a shorter burn with less charcoal. Tools – All of the tools you will be using should be at hand. Once the burn gets going it will require almost your full attention and you will not have time (without consequence) to go search for needed tools. Go here for a selection of recommended tools. Water – Make sure your quenching water is drawn and ready. Also have water (or other beverages) for refreshment. Food – if you are planning to do any cooking, all of your food should be prepped and ready to cook. Safety – A water hose ready to spray or a fire extinguisher should be nearby. A burn kit or other first aid should be at hand. Equipment – Make sure your CharCone is properly assembled and the rim shield is locked in place. The cap should be tightened over the drain and the whole system should be on level, solid ground with any combustibles a safe distance away. It is important to start the charcoal making process from a good base of burning embers and a preheated cone. To accomplish this the raft technique seems to work best. It entails building a stack of smaller (6″-8″ L) sticks in the cone to form a “chimney”. The raft is then filled with light, very flammable kindling (a little accelerant is permitted here as well) . Make sure you read the section below on the layering technique before you start the burn. When the raft is prepared and you are sure you have everything else ready (one last check around is always a good idea), light the raft from the top. It should catch quickly, burning down but with strong flames coming straight up. Give it a few minutes to get going and when it starts to collapse, give it a little help by compressing it down it a bit. Let it burn until a least half of it is starting to ash over and you are ready to add your first layer. Adding the feedstock in many light layers is the secret to making charcoal in an open kiln. It works on a “flame cap” or “flame curtain” principal whereby the fire burns only at the top (3-6″) of the fuel stack. The fire on top consumes most of the available oxygen (limited by the design of the kiln) and the wood deeper down does not “combust” but still keeps on “cooking”. It is still over 500F or hotter down there, hot enough to release volatile gases and water vapor. Those gasses feed and are consumed by the fire as well. 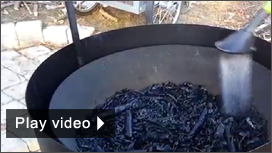 This process (the transformation of organic material through elevated temperature and in the absence of oxygen) is called pyrolysis and is the essence of how charcoal is made. The trick is, you have to keep the flame going on top without smothering the fire or even causing it to stall enough to create smoke. That means putting the next layer on at the right time, in the right quantity and of the appropriate weight. It takes a little practice to develop this skill and there are other factors such as ambient conditions, feedstock moisture levels, etc. but once you get the hang of it, it flows pretty easy and becomes an engaging challenge. The layering technique in a nutshell: Wait until the previous layer starts to ash over, then add the next layer being mindful of keeping the flame burning cleanly. One more fact about the fire dynamics: the CharCone is designed to create a horizontal vortex of air currents to recirculate the combustion gases and smoke back into the fire for cleaner processing and emissions. It achieves this by the shape, slope and depth of the container and by the rim shield, which acts as windshield but also creates a convection current by heating the air between it and the cone. Ironically, the smokeless result of all this makes it hard to notice the vortex current, but if you look closely, you can see the odd wisp of smoke and even the flames curl inwards. Start by tossing on a few smaller sticks that you know will burn well. Important: try to arrange the sticks so that they are NOT aligned in parallel and close to each other. Stack them crosswise using the same technique as when you built the raft. This creates space all around the feedstock and helps keep the fire from smothering. Gradually keep adding more feedstock until the flames decrease. Now wait until the flame recovers a bit and then try evening out the layer by filling in the uncovered gaps. Let the flame fully recover and wait until the entire layer has caught fire. When a light layer of ash appears on a good portion of it, start adding the next layer immediately. Use the smaller, thinner and/or drier feedstock for the first few layers. If you’ve sorted your feedstock, you can mix in some of the thicker pieces in the middle (they need the higher heat to cook). Always have some small kindling or light tinder on hand to keep the flames going if the fire is struggling or there is excess smoke. If need be, add some oxygen by agitating the char slightly to allow better air flow. You can also remove the drain cap temporarily to let some air in from the bottom. Be sure to cap it quickly when the flame recovers. 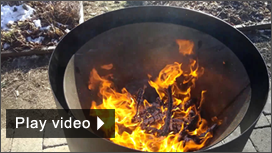 Some portions of the char mass may seem to be cooking hotter and have more ash. This may be due to ambient wind currents and is corrected by rotating the CharCone as needed. You also may notice a section (near the top of the mass) where no burning seems to be taking place. Agitating this area slightly and adding thinner feedstock directly over it on the next layer will help even this out. Repeat the layering process until you are ready to end the burn. We recommend stopping when the bowl is no more than three-quarters full. After that the structural elements that help control the flames will not work as efficiently. The burn ends when either you run out of space in the cone, run out of feedstock, or run out of time. You can stop the burn at anytime by following the procedure below. As you get close to the end of the burn, there are a couple of things you can do that will make for a better end result. 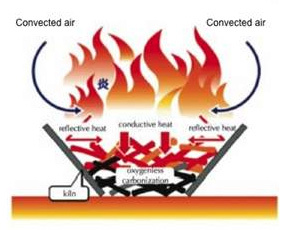 Since the flames will be diminishing (you will not be adding more feedstock), there is much less time for the topmost layers to complete the pyrolysis process. To compensate for this, you can add some very small, dry kindling or even dried leaves to keep the flames going without creating another true layer. Let the last layer ash more than usual to ensure that it is burned through and that the lower layers have had time to “finish”. Have your water ready for the quench. Finally, you quench the fire and all of the charcoal to end the process. There are both dry and wet quenching techniques. The dry quench – In dry quenching you must seal the entire vessel so no air can get in. Without any oxygen, the entire system will extinguish. This has its advantages in that when cooled, the charcoal will be dry and ready for further processing or its next use. It also eliminates the need for water, a processed resource that adds to the carbon cost of the operation. However, we do not recommend the dry quench method. Dry quenching has one very strong disadvantage – safety. Charcoal in the center of the kiln, even though not visibly on fire is still “burning”. If even just a little oxygen is present (a small leak in the system or ending the quench too early), the coals would not be fully extinguished and could easily reignite when exposed to oxygen after emptying. There have been numerous cases of this exact thing happening with backyard kettle grills. Think of the “ashes” in your home fireplace able to reignite a fire the next morning. You can never be sure that a dry quenched fire is completely “out”. The wet quench – If you want to be sure that the fire is completely extinguished, soak it with water. This can be done in two ways; 1) quenching from the top – simply adding water from a hose or watering can, or 2) quenching from the bottom by attaching a hose and letting it fill from the bottom up. There are advantages and disadvantages to each method but either way, you are assured of a complete quench. The disadvantage of wet quenching, in general, is the use of water and fact that the char now is a bit soggy and may have to be dried before further processing. The CharCone is fitted with a drain at the bottom, and a hose adapter is available for bottom quenching. After the wet quench is complete, the drain can be opened and the excess water drained off. Capture it if you can and use it for watering your plants. The pH will be quite high though (10-12) so be sure your soil or plants can tolerate it. At this point (after the quench) you can sort your batch in a couple of ways and for a couple of different reasons. First, you will want to separate any pieces that are not fully “charcoalized” (pyrolized). You can test this,if it is not obvious visually, by trying to break it. If it doesn’t snap apart easily it is probably not fully cooked. Set it aside for inclusion in the next burn or put it on the” fuel pile”. This is the optional part. If you want to reserve some of the charcoal you have just created for use as fuel this, these pieces would be a good choice. The smoked or wood flavoring associated with charcoal cooking usually comes from incompletely burned charcoal like this. Pick out any larger pieces as well if you need it. Larger pieces are more convenient to cook with and less convenient to process (crush) further. While the charcoal is still in the cone you have a great opportunity to crush it. If you are intending to mix it in with soil for growing plants or vegetables this is an important step and will need to be done eventually. Of all the steps in making biochar, this is one that does not have too many easy options. You need to get the particle size down to a uniform 1/8″ or less ideally and that is not easy at all. So while you have it in the cone (think mortar), get and old baseball bat (think pestle) and pound away. It can be tedious work but it doesn’t take that long, is great upper body exercise, and I actually think it’s fun. After quenching, draining and optionally crushing the charcoal you are now ready to remove it from the cone. First, unlock the rim shield and remove it. Method #1 – lay out a 9′ x 9′ tarp in front of the cone. Carefully tip the cone so that it spills out onto the tarp shovel out all of the charcoal onto the tarp. Spread it out for drying, cover it up for later processing or remove it to another container. Method #2 – simply shove the charcoal out of the cone and into a metal pail (you will need a 10-20 gallon pail) with a tight closing lid. This is excellent long-term storage but also you will now be 100% sure that the fire is OUT and the container or anything else will not catch fire. If you are planning to use your charcoal as a soil amendment then you should consider testing it before you add it to anything that you want to grow (or eat). There are some simple field tests for biochar (what charcoal is called if it is intended to be sequestered or for agricultural use) and some more complex tests if the use will be more critical to health or safety. If your feedstock was good, clean woody stuff and it was burned at a high enough temperature and for a long enough time, most harmful components will have been removed. If you are not sure, have it tested or just put it in the trash and send it to the landfill. There is more information on testing and testing resources here (Biochar) and here (Resources). If you’ve made sure that your charcoal is good to go and it’s crushed up nicely, you may consider “charging” it before it goes into the soil. Charging charcoal is the process of conditioning it with additives that both utilize it’s unique structural properties and maximize the benefits it can bring to the soil and what grows in it. Charcoal has a very distinct and important structural property. It has a microscopic honeycomb structure that vastly increases its surface area and creates a huge potential for absorbing minerals and nutrients and providing shelter to tiny bacteria, fungi and other life forms that create healthy soil and help plants grow. Processed charcoal is like an empty vessel waiting to be filled. If added directly to soil, it might take in existing nutrients and water and actually inhibit plant growth. Charging the char with compost or other ingredients (even fertilizer) lets it start giving back to the soil much quicker. There are hundreds of articles, studies and tests of doing this and it is a fascinating topic indeed. Here is a good one. You can simply add your crushed charcoal to some high quality compost and let it “cure” for a couple of weeks. Or you can get fancy and add things like rock dust, sea minerals, beneficial micro organisms, root fungal cultures, etc. All have been used successfully as biochar enhancements. In this was you can create a “designer biochar” tailored for your specific needs or preferences. More about using charcoal as a soil amendment to enhance plant growth here.